PowerColor has announced that its non-reference RX 480 GPU now features an unlocked BIOS switch, which will open up a lot of doors for overclockers to achieve new boundaries on air cooling. The custom cooler will be more than capable of handling overclocking stress, at least more than the reference cooler. The advantage of getting an unlocked BIOS switch courtesy of PowerColor is that with the power limits disabled, overclockers will able to further tweak the card to achieve a higher stable overclock for additional performance in the latest video game titles. According to the company, increasing the power limits of the GPU is not going to void your warranty, but if the custom RX 480 goes up in smoke, then you have just yourself to blame. PowerColor has recommended that tweakers do not proceed to running the stability test application FurMark, since it can cause irreversible damage to GPUs that are running at their stock frequencies as well, which suggests that it can wreak havoc for overclocked graphic cards. The GPU comes with a factory overclocked GPU clock speed of 1330MHz and its 6 + 1 VRM phase design will be able to distribute current more evenly for a more stable overclock. However, we are bothered to see that there’s only 1 dedicated VRM for the memory chips, so you’ll have to monitor those memory clocks quite closely when power limits have been raised. 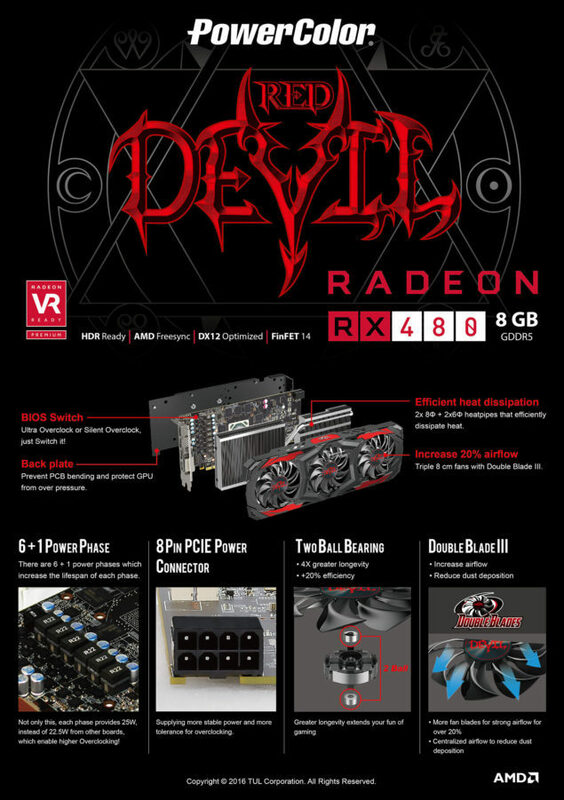 In addition, the PowerColor Red Devil RX 480 features a Double Blade III cooling solution, which according to the company increases air flow and reduces dust accumulation on the fan blades. Furthermore, a nickel-plated heat pipe appeared to the manufacturer as the best possible way to move heat away from the GPU. 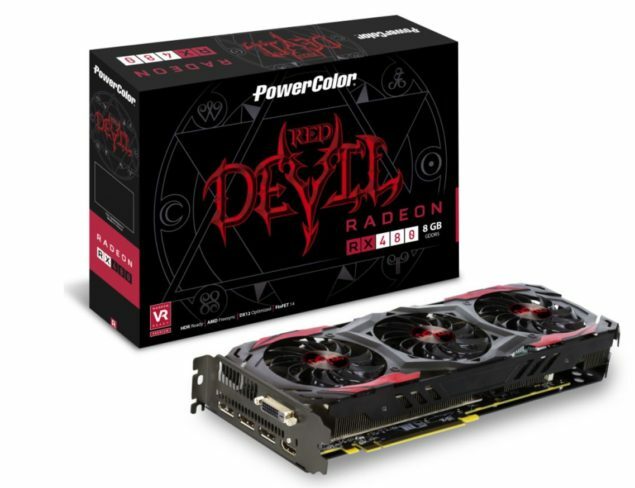 PowerColor Red Devil RX 480 is based on the latest GCN 4.0 architecture which makes use of the FinFET architecture to deliver low power consumption, lesser voltage leak and better performance. AMD deploys a completely new architecture for Polaris chips with enhanced features such as Primitive Discard Accelerator, Hardware Scheduler, Instruction Pre-Fetch, Improved Shader Efficiency and Memory Compression. As a result, these GPUs can deliver up to 1.7 times the performance per watt increase thanks to the FinFET architecture while AMD exclusive technologies will help drive this efficiency up to 2.8 times which is thoroughly impressive. Do you think that PowerColor has done the right thing by disabling the power limits of its RX 480? Tell us your thoughts right away.